A Planned Gift is a contribution that is arranged in the present and allocated at a future date. Commonly donated through a will or trust, planned gifts are most often granted once the donor has passed away. Planned gifts are a way to provide NOAH with significant resources to further its mission to serve the albinism community. The most frequent type of planned gift is a bequest through a will. Bequests to NOAH made in your will can be a fixed dollar amount, a percentage of your estate or some other amount. Here are two samples of bequest language. Confirm with your lawyer that this language is appropriate for your circumstances and wishes. You can also make a planned gift using the beneficiary designation of your IRA, 401(K) or other retirement plan. These gifts avoid estate and income taxation on the assets accumulated tax-free during your lifetime. NOAH is a Pennsylvania not-for-profit corporation. Our Federal tax ID number is 23-2265173. Our mailing address is, PO Box 959, East Hampstead, NH 03826-0959. If you have already planned for or are considering donating to NOAH in your will, then you may wish to join NOAH’s Legacy Circle. Members of the Legacy Circle are those who state that they intend to make a bequest to NOAH. You need not state an amount or make a pledge. Legacy Circle members will receive regular updates on NOAH initiatives. If you are willing, your name will be added to the online roster of Legacy Circle members. 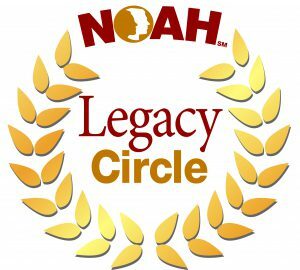 To join NOAH’s Legacy Circle, please complete the Legacy Circle form. Information provided on this webpage is for informational purposes only and not considered to be legal or financial advice. 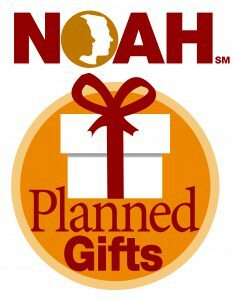 NOAH recommends consulting with a professional when considering a planned financial gift.